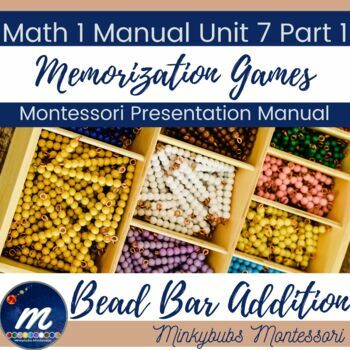 Learn all of the original Montessori memorization games for little addition here from an accredited Montessori source. This document includes Snake Game Addition Material Analysis and 8 addition presentations. All of these presentations prepare the child's mind indirectly for the concept of algebra. To aid the child in memorizing all the addition combinations. To familiarize the child with all the possible number combinations that make ten. To prepare the mathematical mind. To prepare for counting in base ten. To develop order, concentration, coordination, and independence. To show that an addition can be made with bead quantities. To develop independence and sharpen the mathematical mind. To show the commutative law. To introduce the associative law. To introduce mental division, where the child must keep a sub-total of one combination in mind and then add it to another addend. At this point we are moving beyond chart 1. To introduce work with parentheses. To give the dis-associative law. To help the child to abstractly perform dynamic addition mentally. This work can be completed without the use of the bead bars during the lesson, but it is more effective for the child if they can experience the lesson sensorially. The colours used in the images follow Montessori's bead bar colours.